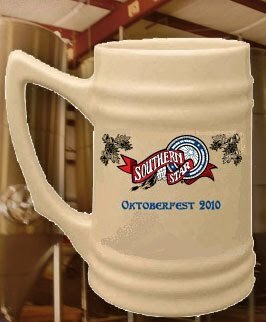 Southern Star Brewing has announced they're having an Oktoberfest party out at the brewery on Saturday, October 23rd from 6pm ~ 10pm. The price is $30 per person which includes a 24oz commemorative ceramic beer stein and a plate of German food (more food can also be purchased if you're still hungry). Only 300 tickets will be sold which can be purchased online at their website. In addition to their regular lineup of beers, they will also have the 2010 Pro-Am Smoked Porter plus some speciality casks made just for the celebration.